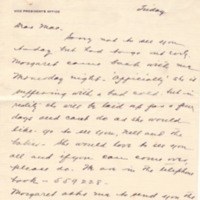 Margaret asks me to send you the enclosed letter. There is no better man with whom to do business than Mr Wilson. A Princeton 1904 man named Lawson is with Bishop & Co, Real Estate, Pasedena would like to have a chance at you - He is all right, too. Elliott, Edward, 1874-, “Edward Elliott to William G. McAdoo,” c. 1922 March 9, WWP19595, Eleanor Wilson McAdoo Collection at the University of California-Santa Barbara, Woodrow Wilson Presidential Library & Museum, Staunton, Virginia.